Of course, you can’t go wrong with a simple pairing of Figs with Prosciutto or Gorgonzola Cheese! I might just have to add one more appetizer at Thanksgiving! One of my friends asked me for ideas on how to cook the bird so here are few of them. My favorite technique is from Jacques Pépin. He did a show with Julia Child many years ago and I’ve been able to find it on Hulu. Jacques deconstructs it, stuffing the boned out thighs among other things, and then puts it back together for presentation. The trickiest part about this recipe is the preparation before you stuff it. Cutting out the back bone and ends of the drumsticks requires strength, good poultry shears and a heavy cleaver, or if you buy your Turkey from your local butcher (my favorite is Café Rouge in Berkeley), you could ask them to do it. Please use caution if you do it yourself! I suggest you get someone to assist you at the beginning since it’s hard to maneuver the big bird alone. In past years, I’ve wrapped the legs with parchment paper in addition to foil, but this year, per the suggestion of the talented and creative Chef/Owner of Café Rouge, Marsha McBride, I’m going to wrap the legs with Pancetta or Fatback, and then wrap with parchment and foil. I like to put some vegetables on the bottom of the roasting pan and under the bird to help air circulate and allowing for crisper skin (i.e. Carrots, Parsnips, Leeks, Shallots and I’ve also tried adding large pieces of Fuyu Persimmon). After cooking in the Turkey juices, those veggies, chopped up, could even be another side dish with a little fresh Parsley or Chives sprinkled on top to brighten them up, pureed for Soup, or used in Turkey Pot Pie if you have leftovers. There are a couple of side benefits of deconstructing the bird. The first is that your cooking time is much less than for a whole Turkey, and second is that storing any leftover carcass takes up much less space in your refrigerator. 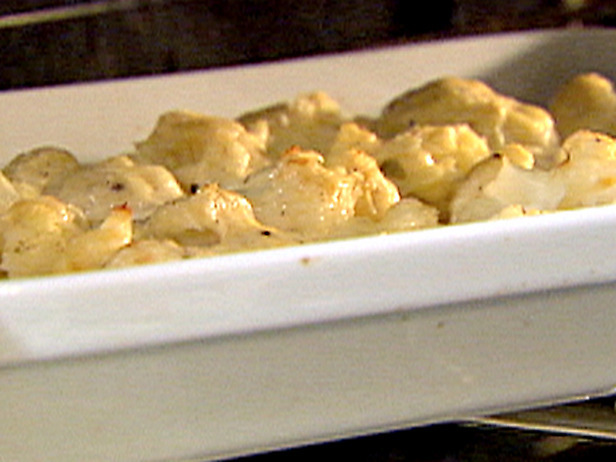 Jacques provides a stuffing recipe but like most recipes, I like putting my own twist on it. I leave out the sausage and like adding a little finely chopped Granny Smith Apple (they’re not too sweet), or sauteed Mushrooms. You may need to watch his show a couple of times, like I did, before you feel confident that you can do this, but it’s worth it, and he is a master instructor as well as a master chef–so give it a try! I also like to brine my Turkey overnight. Here is a Basic Brine recipe from the Food Network. I suggest using no more than 1/2 cup of Kosher Salt to each gallon of Water (depending on the size of your bird–it should be submerged) since you don’t want your Stuffing to be too salty. If you want to experiment a little, add 1-2 bottles of good Beer (an Ale would be perfect, and I wouldn’t use a light Beer, like a Pilsner), or 1 bottle of Apple Cider, then include a few Bay Leaves. You could add 1/4 cup of Maple Syrup too, but I personally would not add more than that since it could caramelize too much after cooking for hours. Of course, you can add many other ingredients like Coriander Seeds, Juniper Berries, Rosemary, or Citrus Peel. Put the Turkey in a large zipper bag and place it in a large container (in case it leaks) and then in the morning, drain it and dry it very well so the skin will crisp in the oven. You could use an ice chest if you can keep it under 40 degrees, but not colder than 26 or it could start to freeze. Putting some Buttery Spice Paste or an Herb Lemon Butter under the skin will add moisture and flavor. And last, I heard Chef Eric Ripert, most renowned for his restaurant Le Bernardin in NYC, suggesting ideas for Glazes for the Turkey: BBQ Sauce with Orange Juice or Balsamic Vinegar, and Pomegranate Molasses which is fruity and tart (I think you would need to thin it with a liquid–maybe stock or White Balsamic so it’s not too dark). I wouldn’t put the Glaze on until the latter part of the roasting time since the sugars could make the skin too dark. If you try any of the above, I’d love to hear how it turns out! The photo above is a Frisee & Arugula salad with Walnuts, Fourme D’Ambert and Dried Apricots from the recently opened Broadway by Amar Santana (former Executive Chef of Charlie Palmer) in Laguna Beach. Very tasty! What I love about salads is that you really don’t need a recipe, so I hope you won’t be upset that I don’t give you a specific one. Think about a few components, and then compose! First of all, for the base of the salad, this time of year, I especially like using Escarole, Arugula, and Belgian Endive. I enjoy their slightly bitter and peppery flavors. Of course, Spinach is great year round and easily accessible. It’s nice to toss in a bit of Radicchio for color, or thinly shaved Fennel for crunch. Dried Apricots, Cranberries, Cherries, Dates, Figs, or Golden Raisins are also tasty alternatives. Cheese is another wonderful component to add to a salad. I am particularly fond of Blue cheeses like Gorgonzola, Roquefort and Cambozola. Shaved Parmesan is another great one to add, as a garnish. Using a vegetable peeler works the best! Speaking of dressing, I prefer my vinaigrettes on the sharp side. You can’t go wrong with the traditional French ingredients (Dijon Mustard–1 teaspoon, a small Shallot–finely minced, 2 Tbsp Red Wine Vinegar–I like Sherry Vinegar the best, a good pinch of Sea Salt and a few coarse grinds of Black Pepper, and 6-8 Tbsp Extra Virgin Olive Oil). If you’re interested in changing the flavor a little, remember freshly squeezed Lemon, Lime or Orange Juice, Nut Oils, a dash of Soy Sauce or Sesame Oil, Apple Cider or Rice Vinegar, grated Ginger or Garlic, Honey, fresh Herbs like Parsley, Tarragon or Chives, dried Herbes De Provence and lastly, Truffle Oil–one of my favorites. Of course there are all kinds of other options to add into your salads. Radishes are always nice for a bit of color and Celery, which is often underappreciated, is another good one for adding texture. Crispy bits of Bacon or Pancetta–need I say more? The next time you make a Spinach salad, try adding Mushrooms, grated hard-boiled Egg and Sunflower Seeds. Shaved Fennel, sliced Mushrooms and shaved Parmesan with some Lemon juice and Olive Oil is another nice combo. I could go on and on, but as you can tell, the possibilities are endless! Thanksgiving is less than 3 weeks away so it’s time for me to start doing a bit of menu planning. Every year, I tell myself “keep it simple!” but for someone who enjoys being creative in the kitchen, it’s hard not to go overboard when I’m entertaining for people I love. But of course, I want them to be hungry for dinner! Blue Cheese and Walnut Spread from Martha Stewart. 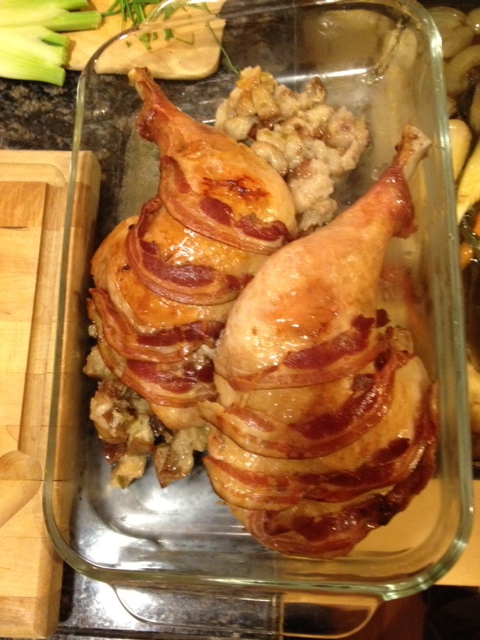 I think I’ll serve it with Celery sticks and sliced Apples, in lieu of crackers, to keep it light. Place all ingredients except Zucchini into your Vitamix or food processor and blend until creamy (if it’s too thick, you can add a little Extra Virgin Olive Oil, water, or some of the brine from the jar of Capers). 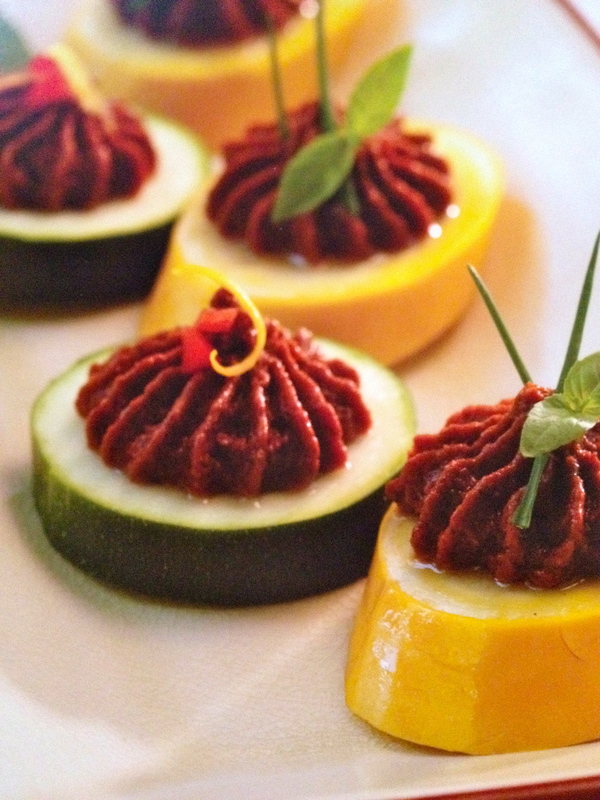 Top your Zucchini rounds with the Tapenade and garnish with some Lemon Zest. I’ll probably make the Blue Cheese Spread and Tapenade in advance for convenience. Next, what to make for the sides? I’ll keep you posted!